The Nomadic is a 12 room lifestyle hotel geared towards the adventurous traveler, finished in late 2016 it is situated within minutes walking of world class surf in Playa Guiones, Nosara, Costa Rica. Dreamt up by us a couple from Georgia after driving to Costa Rica decided Nosara was indeed the place we wanted to lay some roots. After backpacking much of 2012 we were inspired to create a space that would nourish friendships like the ones we made during our travels. We knew when we came down that we wanted to create accommodation that would focus on the creature comforts. We could feel that Nosara was up and coming and needed something fresh and in the middle that would attract our peers. We decided to add the dorm style room and in the end it proved to be a great addition that helped guests come together to create the family style vibe we were looking for. We've had guests tell us that they don't even know how to classify us as they feel like they are staying with family. While our rooms are extremely cozy, we tried to put more emphasis on our common areas to get guests out and meeting people. The communal breakfast is usually where all the guests come together to talk about their plans for the day or past days adventures. We worked extremely close with our local architect for close to a year, a lot of back and forth to be sure we came out with something extremely unique to the area. 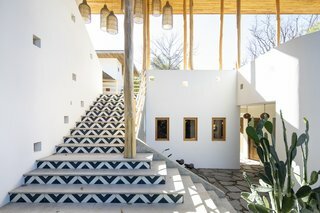 We gained inspiration from our travels; wood and concrete work from Mexico, lights in the concrete squares from Morocco, thatched roof and hanging basket lighting from Bali and chevron designs from Costa Rica. There's so many features that make this space so special like star gazing on the roof top terrace while playing a round of shuffle board or just relaxing with a cocktail in hand in the living beneath the giant teak columns. uploaded Nomadic Nosara through Add A Home.